Hello friends, Samm Bennett here. I play a lot of different kinds of gigs, with a large variety of musicians as well as solo shows, and I often play completely different sets of instruments and sound makers from show to show. So I've decided to document some of them. Very compact drum kit. It's possible for me to carry this, by myself, across town on the subway. But… it's a *bit* of a struggle. Some sore muscles the next day are very likely. 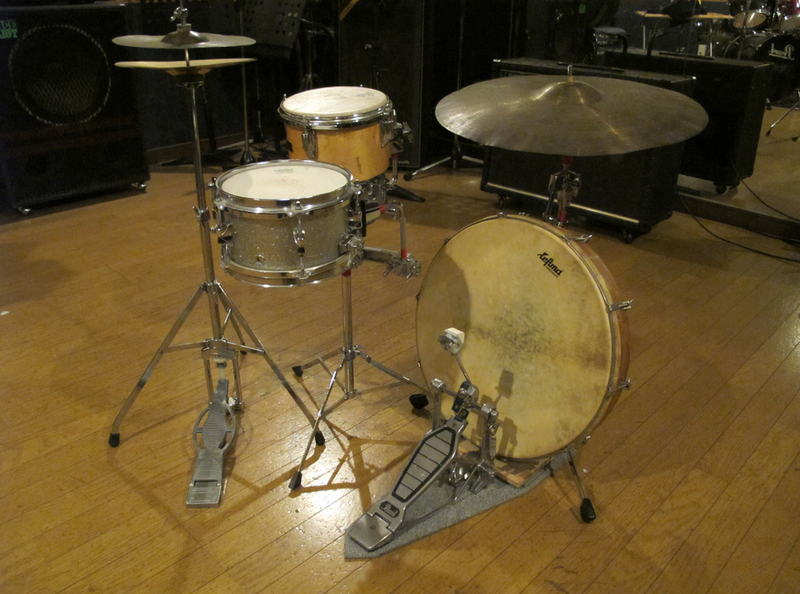 The hi-hat is a vintage Ludwig from the 60s. Lightweight and it feels fine. Love it. The little tom is an 8-inch Tama that I've had since, oh, about 1980 or so. A real workhorse, that little guy: used to be part of my tuned drum setup that I used in solo shows in the 80s. Took it all over Europe. 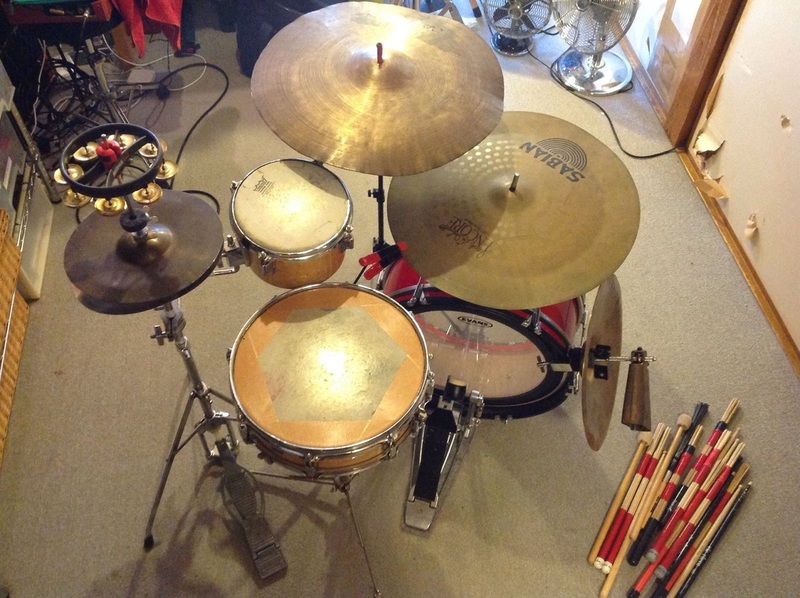 The big ride cymbal in the center is a beautifully trashy junk cymbal, made by Swingstar. Swingstar! The big Sabian china cymbal is mounted on the bass drum using a cowbell post (the kind that attaches to the rim). On the right side of the bass drum, another cowbell post holds a third cymbal (from Korea) and… a cowbell! The two photos above show another compact drum kit. In this one I've used a large frame drum as the bass drum. It's workable if the frame drum is mic'ed up, but if not, well, there's just not *quite* enough punch from it. Very portable, though! This an all-on-one-stand I put together and worked with for a little while. The big drum is a Remo bodhran (the same one I use in my Walking Drum) and the snare is a shell-less Rhythmtech "Laptop" (I also use this in the Walking Drum configuration). 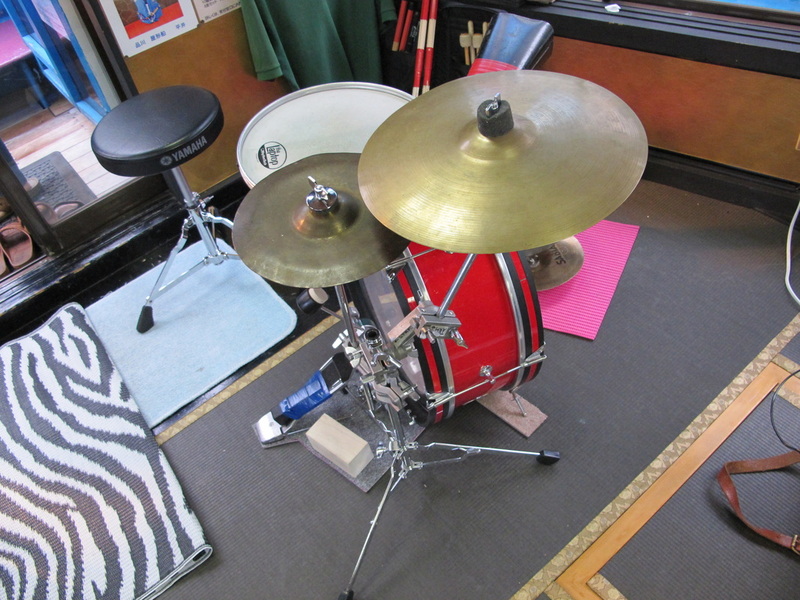 Also mounted on the one stand: a cowbell, a splash cymbal and two cymbals together (for a closed hi-hat sound). 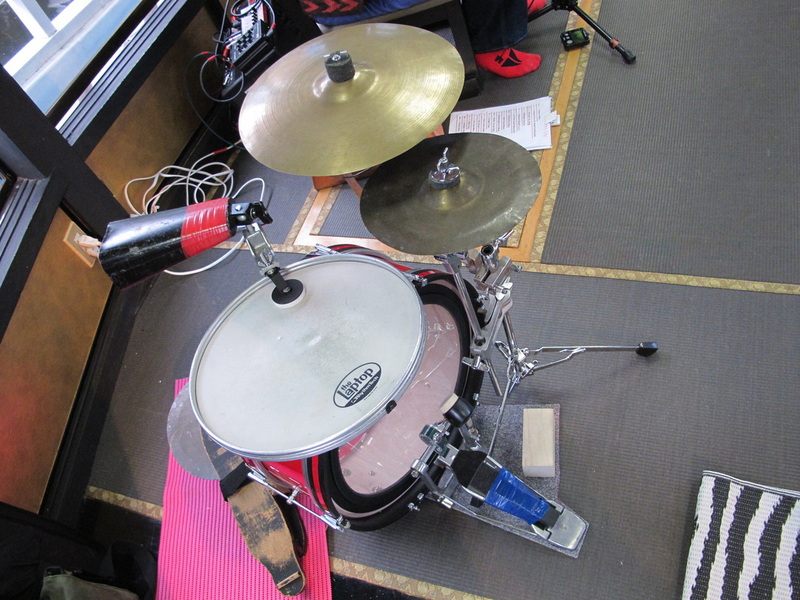 The "kick" drum was a stomp box (homemade) and I used my old "snowshoe" for the left foot. 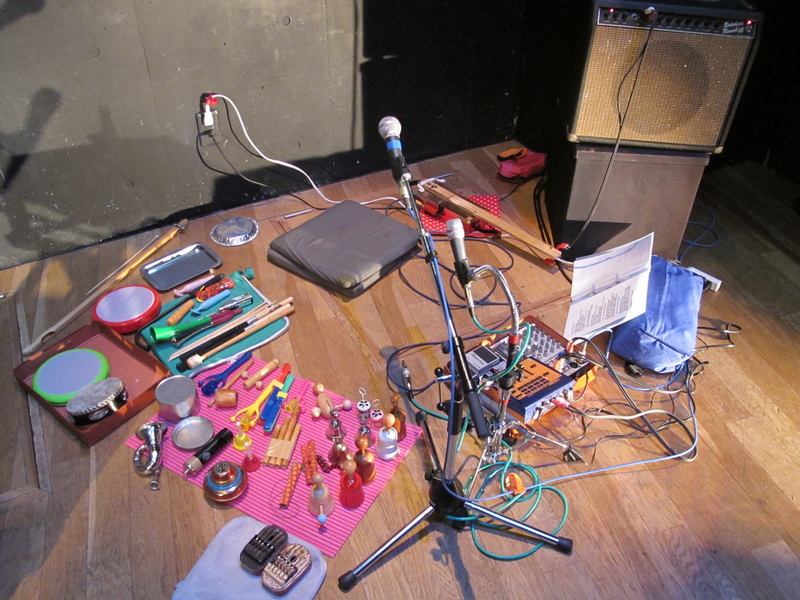 This setup consists of various small percussion and a few wind instruments. There are two mics, for vocals and for the little instruments. Either mic can be run through the effectors you see in the little box: a pitch shifter, EQ pedal and delay pedal. 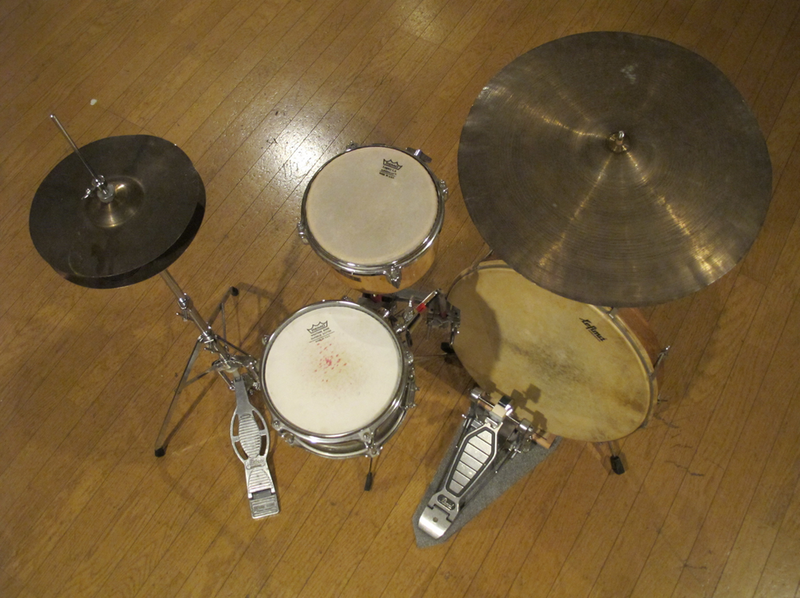 This was my setup for a duo concert with percussionist Takashi Kazamaki at Kid Ailack Hall in Tokyo. 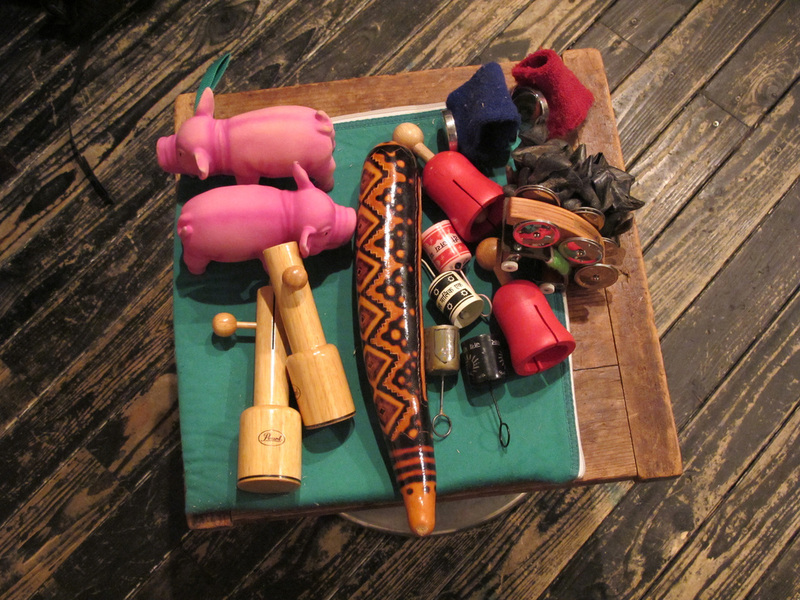 Below is a closer view of the little instruments. 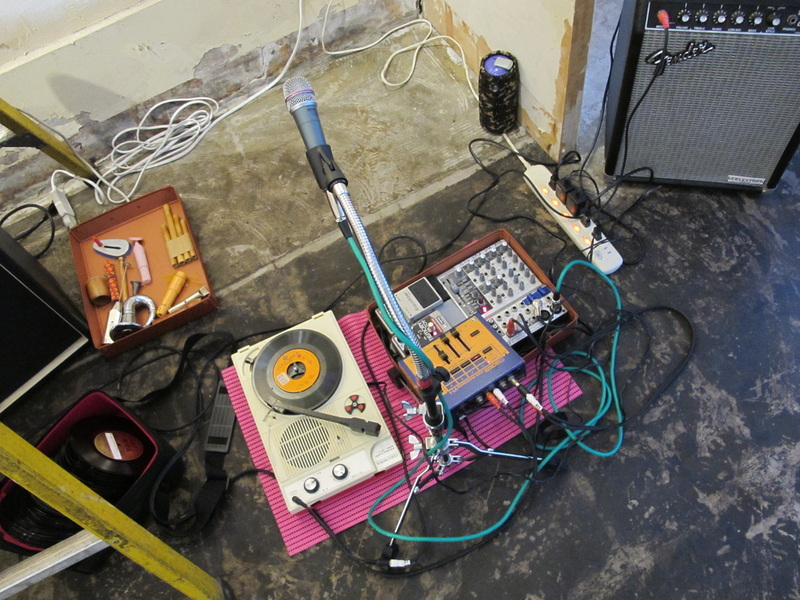 The two photos below feature my ultra-portable, ultra-small drum kit. The first view is from my side, more or less. You might wonder how I could play the kick drum (an 18" marching bass drum that I modified) with my right foot while playing the antique hi-hat contraption (from the 1920s, called a "snowshoe"). I play the kick drum pedal with my heel, as opposed to the more normal playing method using the ball and toe of the foot. This kind of set up comes in very handy when the drums really need to go into a very tight space, as was the case here: the drums are set up on a boat, one of those Japanese party boats that seat about 40 people, at two rows of tables running the length of the rather narrow boat. The band I was with on this gig (a trio, led by Mississippi blues man Steve Gardner) had to set up at one end of the boat, and my drums were just to the left of the entry. A traditional bass-drum-in-front would hardly work here! But I like using the heel anyway. Below is a view of the kit from the audience perspective. Note the wooden block on the floor next to the pedal: that's where I rest the ball and toe of my right foot. The heel, then, rests slightly higher on the pedal, which I've modified with a rubber door stop (attached with stylish blue electrical tape!) giving the heel essentially a flat surface to rest on. Don't know if anyone else has ever come up with something like this for playing kick drum with the heel. Perhaps I'm the first. Here's that small kit again, just below, in a not *quite* so stripped-down version. 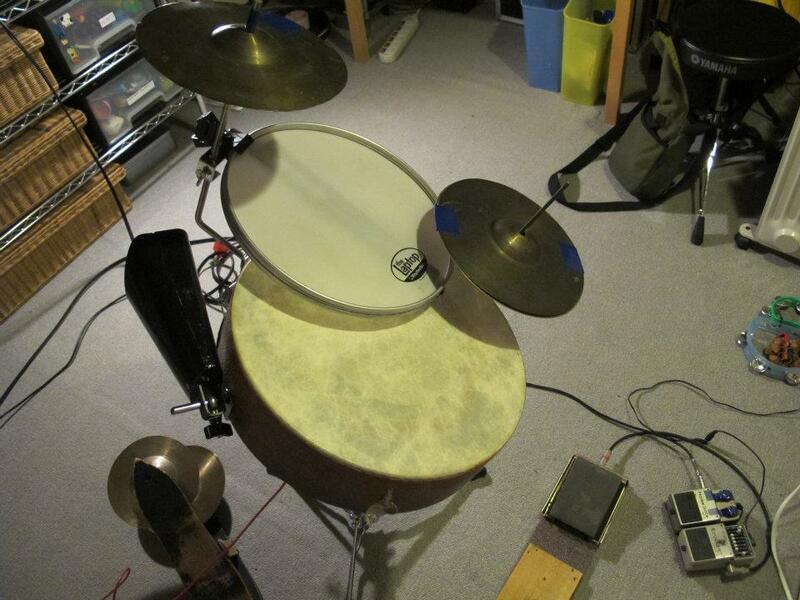 Replacing the 'snowshoe' cymbals pedal is a felt-covered board: there's a piezo pickup under the board connected to the KORG WaveDrum mini you see sitting on the drum chair to the other side of the kit. For years now I've enjoyed mixing in some electronic sound with an acoustic drum kit for sonic interest and variety. I run the WaveDrum Mini through pitch shift and/or distortion, to make things more interesting. Also added in this version: a small Tama 8" tom tom (actually more like half a pair of bongos) which I've had since the 1980s. And the snare here isn't the RhythmTech "Laptop" seen in the previous setup, but rather the Steve Jordan model 8" snare that's part of the Steve Jordan Signature cocktail drums kit. 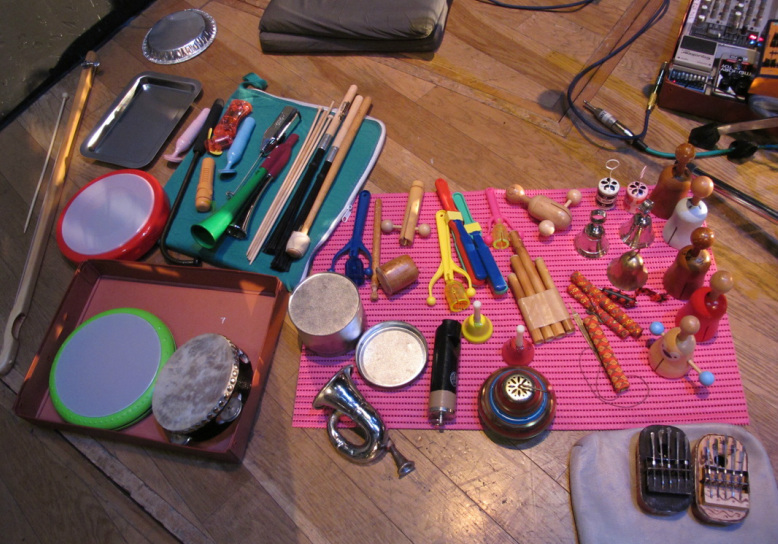 As usual, there's also a tray of little percussion instruments alongside. 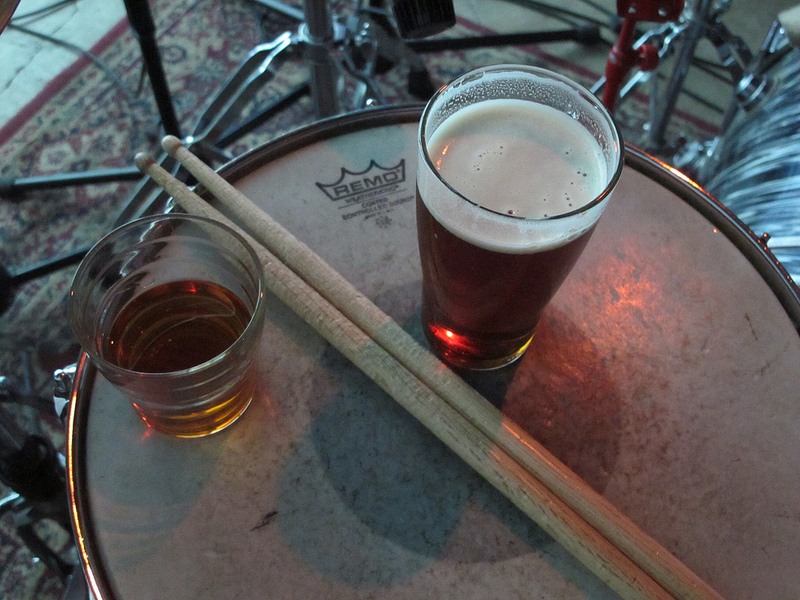 I often play the drums with little instruments, instead of drumsticks. I like to play with shakers, various kinds of rattles and clappers: get some extra sound and texture going, create some 'sympathetic' rhythm parts, etc. This photo was taken at a Third Person gig. By now you might've noticed the ubiquitous hot pink non-slip mat. I am a great believer in and proud endorser of non-slip mats. And hot pink ones are recommended, for sure. Now, this next setup is one that I use from time to time, not all that often, maybe two or three times a year. But I love to spin and scratch and manipulate 7" records, it's just a lotta fun, you know! I'm running the record player and the vocal mic through a pitch shifter, EQ pedal and delay pedal. 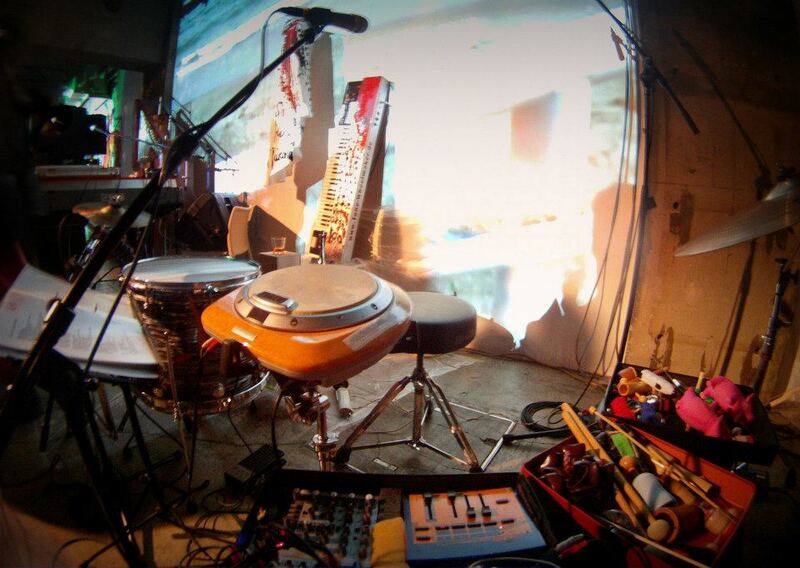 This shot is from a duo gig I did with laptop musician Carl Stone, at Haus Gallery in Tokyo. The record box to the left of the photo has about, oh, 40 or so discs in it, a wide variety of stuff I've collected over the years. On the turntable at the moment is a Columbia record of solo vocal music for Noh play. Appropriately enough, then, it's being played on a Columbia record player. It's a very old design, but still being manufactured here in Japan! I love it. Even when I do gigs where my main instrument is stick dulcimer and singing voice (solo, or with S&H, for example) I often bring along a few extra items to bring a bit of variety here and there. The two members of the High Exalted Mystic Squadron of Singing Pigs that you see here have become my trusty companions: I rarely leave home without them! 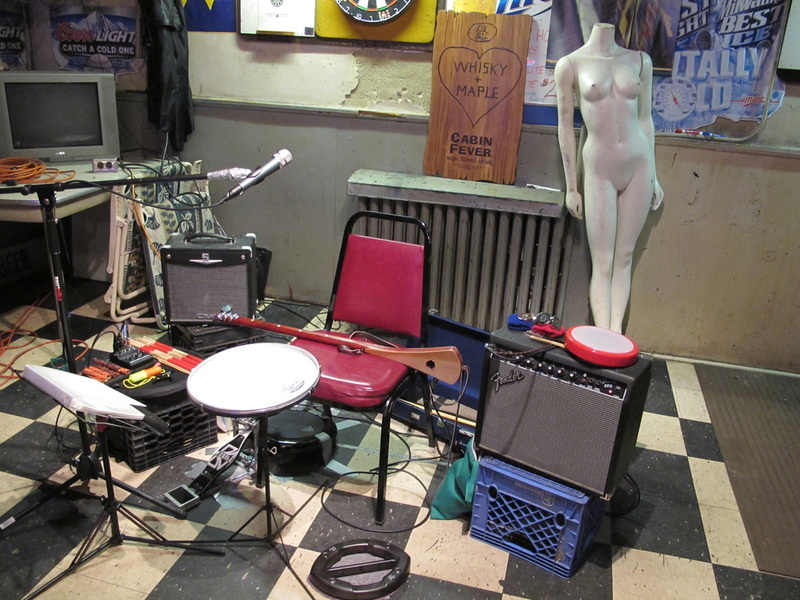 Below is the setting I used at a solo show in Youngstown, Ohio in November 2013. Three-string guitar, ultra-thin snare drum, mouthbow, jaw harps and percussion. The Pigs are in the green bag, waiting to make their Youngstown debut. 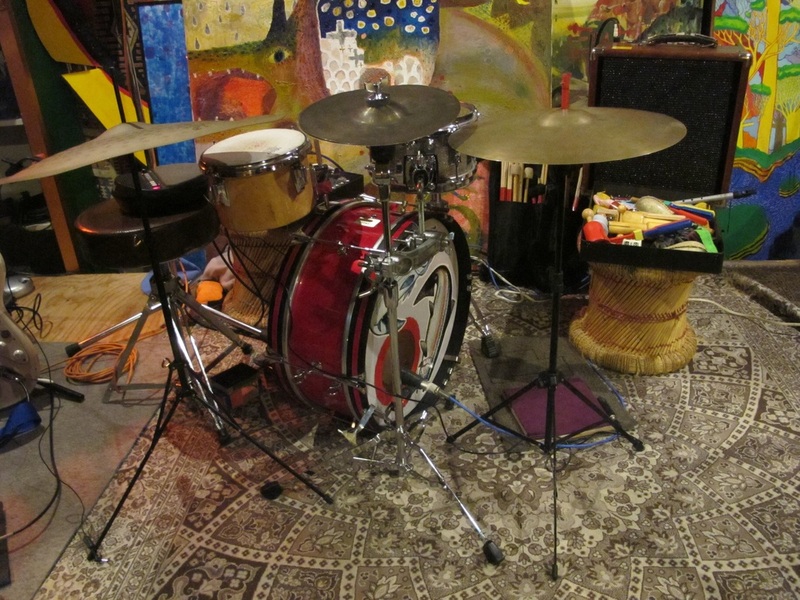 Note also the KORG WaveDrum (it's the newer model, very lightweight and portable) which I play with a *backwards* kick drum pedal. That's running into the little amp to the left. The Fender on the right was for guitar and vocal mic. Yep, sometimes when I play in places with no PA, I'll sing through a guitar amp. Whatever you gotta do, right? My precious KORG WaveDrum (original model, from the 90s). This shot was taken at the last (100th) installment of Morgan's Organ at Super Deluxe, Tokyo. You'll also note, of course, the presence of two members of the High Exalted Mystic Squadron of Singing Pigs, to the right of the photo. I rarely travel without at least a couple of my beloved Pigs.The keyboard leaning against the wall was played that night at Super Deluxe by Mr Morgan Fisher. While he played it, the keyboard (as well as Morgan!) was painted, yes painted, by the immensely talented and very beautiful Keeda Oikawa.